Tournament Location - BASC recreational tournaments are held at the Indian Springs Sports Complex (ISSC), located at 13600 South 145th East Avenue in Broken Arrow. The complex is divided into two sides: east side (fields: 1-27) and west side (fields 28-41). Please check the website for field information. Tournament Headquarters – The Tournament Headquarters (HQ) is located on the east side of the ISSC, in the center island just east of the concession stands. HQ is the location of all tournament operations including team check-in, field marshal check-in, scoring, award presentations, and lost and found. Complex Facilities – Free parking is provided in designated areas on both sides of the complex. Restroom facilities and concession stands are also available on both sides of the complex. Covered pavilions and a playground are also located within the complex. Warm up in Penalty Area/Field Use – Per BASC and City of Broken Arrow Parks and Recreation Department policy, teams will not be allowed to warm up or practice in the penalty areas of U-9 and above fields (fields 1-10, 13-16, 26-34 and 37-41). This restriction includes goalkeeper warm up. Teams found violating this policy will be given a warning and asked to leave the penalty area. Teams that do not comply immediately or violate the policy repeatedly will be subject to disciplinary action, which may include a deduction of team points, forfeiture of a game, or expulsion from the tournament. All fields are for official games/team use only. On field activities by others (spectators/visitors) is not permitted. Standard of Conduct – All visitors to ISSC are expected to maintain a high standard of conduct, keeping in mind they are a guest in a public area with children present. The use of foul, abusive, or threatening language will not be tolerated. Should it come to the attention of tournament officials, any person, persons, or team has conducted themselves inappropriately, the Tournament Director reserves the right to take remedial action, which may include a deduction of team points, forfeiture of a game, expulsion of the person, persons, or team from the tournament, or banning of a team or club from future BASC tournament events. Alcoholic Beverages – Alcoholic beverages and glass containers are prohibited at ISSC. The use and consumption of any alcoholic beverage immediately before, during, or immediately after the playing of any youth soccer match is expressly prohibited. Any player or team official who violates this prohibition will be subject to disciplinary action and/or suspension by the Tournament Director. Tobacco/Vapor – Tobacco and Vapor use is requested to be limited to the parking areas of the complex. Pets – Pets are not allowed within any fenced area or near playing fields at ISSC per Broken Arrow City Ordinance Chapter 5, Section 18. This shall not apply to police dogs used in law enforcement, or to clearly identified service dogs used as an aide to a person with a hearing or sight disability. The following types of teams are NOT eligible to play in the Oklahoma Mother's Day Classic. Teams must be registered with a US Soccer affiliate club and currently playing in a sanctioned league. An official stamped copy of the team’s current roster must be submitted and approved by tournament officials before the team will be allowed to play any tournament games. Click here for instructions on how to print your official roster via GotSoccer. This is not a “GotSoccer Roster”, this is an official stamped copy of your team’s roster. Roster must be uploaded to the documents section for the Oklahoma Mother's Day Classic before your team will be accepted into the tournament. See Check-in for instruction on how to upload your documents. Teams will be required to register and play in the age group shown on their official team roster. Teams may request to play up one age group. Play up requests will be evaluated by tournament officials with the final decision to grant such requests falling to the Tournament Director. Playing down will not be allowed. Each player must be properly registered with a US Soccer Affiliate and be included on a current team roster. Player passes are also required for all U11 through U19 age Recreational players, unless not required by your league. If your league does not require player passes, please email tournament@bascok.com before you complete your teams online check-in. Players may not play for more than 1 team during the tournament. Guest players must be included on a current recreational team roster or registered as a recreational player through OSA. An official copy of the guest player’s recreational team roster must be submitted and approved by tournament officials before the player will be allowed to guest play in any tournament games. Upload the Guest Players information per the Online Check-in Procedure. Only players listed on a Recreational roster will be allowed to play in the tournament. Academy only players, who are not currently registered on a recreational team or Competitive players are not allowed to play in the recreational tournament. Guest players must be age appropriate for the age group in which they plan to play. CLICK HERE for full guest player rules and registration procedures. CLICK HERE for the OSA Guest Player Form. Team Check-In Requirements – The online check-in procedure can be found here. Seeding & Bracketing – The Bracketing Committee will seed teams based on the results information provided on the team’s online tournament application and information found on club/league websites or GotSoccer to determine team strength. The Committee will take care to avoid, when possible, having teams who normally play each other in league play being paired to play each other in the tournament. If a team withdraws after bracketing is complete, there will be no reseeding of brackets and games will be shown as forfeits. The tournament committee has the right to combine U7/U8, U9/U10, U11/U12, U13/U14, U15/U16, U17U18/U19 brackets or play each age bracket pure age.Coed teams will automatically be placed in the boy's division. Seeding & Bracketing for Rec + OPL Teams – The Bracketing Committee reserves the right to request that Rec + OPL Teams play up an age group if their addition throws their standard age group out of competitive balance. If the team is requested to play up by the Bracketing Committee but does not want to play up, the team may withdraw from the tournament at that time or its application may be declined. In the case that a 9v9 team is requested to play up to 11v11, the team may add guest players as allowed to expand its roster. Game Schedules – Each team will be scheduled to play a minimum of three (3) games. Teams from outside the Tulsa metro area will not likely be scheduled games on Friday evening. Scheduler will also attempt to avoid conflicting games for coaches who identify that they are coaching multiple teams (via email to tournament@bascok.com. Schedules are published as early as possible to allow coaches time to review for conflicts, but due to the complexity of scheduling, there is no guarantee that all conflicts can be resolved. Coaches are encouraged to have a registered assistant coach present at the tournament. Specific scheduling requests may be submitted but are not guaranteed to be honored. before the registration deadline to be considered. Schedule Request will not be accepted via GotSoccer or after the registration deadline. The tournament committee cannot and will not guarantee that scheduling requests will be honored. The tournament scheduler will try to accommodate as many requests as possible, but due to the number of teams and requests that come in, there is no way to guarantee all requests will be honored. Refunds/Cause for Dismissal/Application Acceptance – Any refund of registration fees is at the discretion of the Tournament Director. Bracketing, seeding, or schedules shall not be a basis for a refund request. No refund shall be provided to a team removed from the tournament due to disciplinary reasons or for providing false or misleading information at registration/check-in. Once a team is accepted the payment form will be charged for the registration fee. Failure to provide correct or adequate payment information will result in the application being dismissed or acceptance being delayed until the issue is corrected. In the event the tournament reaches capacity for an age group any applications with unresolved issues will be declined. 3 Team Flight – Each team plays 2 games in group play. The team with the most points after group play advances directly to the final. The remaining two teams play a semi-final match with the winner advancing to the final. 4 Team Flight – Each team plays 3 games in group play. The top two teams in points after group play advance to the final. 5 Team Flight – Each team plays 4 games in group play, with the champion and runner-up determined by points after group play. No final match. 6 Team Flight – Teams are divided into two brackets of 3 teams each. Each team will play 2 games in group play within their bracket. After group play, the third place teams from each bracket play each other in a consolation game. The 1st place team from bracket A plays the 2nd place team from bracket B and the 2nd place team from bracket A plays the 1st place team from bracket B in two semi-final matches. The winners of each semi-final match play each other in the final. Semi-Final/Final - If a tie exists at the end of regulation playing time in a semi-final or final match, an overtime period consisting of two (2) five minute halves will be played. No “golden goal”. If, at the end of the overtime period, the score remains tied; penalty kicks will be taken in accordance with FIFA Laws of the Game to decide the winner. Inclement Weather and Playing Conditions - Teams will be expected to play regardless of weather conditions. The Tournament Director will determine if playing conditions warrant the postponement or cancellation of any scheduled games. The Tournament Director has the authority to modify any and all tournament rules in order to safely and fairly end the tournament successfully. Referees shall retain the right to decide if safe playing conditions exist. Lightning - ISSC is equipped with a lightning detection system. If lightning is detected, all games will be suspended and all players, officials, and spectators will be required to leave the fields and take shelter, preferably in their personal vehicle. If possible, games will resume once lightning has cleared the area. Rescheduled Games - In the event games are rescheduled due to weather, it is the responsibility of the team’s coach or manager to check with Tournament Headquarters or the BASC website for reschedule information on the same day as the match is suspended. Field Closures - Refer to the BASC website homepage for field closures and live updates during delays. The team with the highest average points will be declared the winner of the division. The same system will also be used to determine wild card teams where necessary. In the event the tournament is cancelled, either in whole or part, the Broken Arrow Soccer Club is not responsible for any expenses incurred by any team. However, a portion of the entry fee may be refunded after any outstanding tournament expenses are deducted. The team that “wins by forfeit” will be deemed to have scored the average number of goals it actually scored in its other matches (up to a maximum of three (3) goals per match) and not to be less than one (1) point. Goals deemed scored will be rounded to the nearest whole number. Decimals of .50 or greater will be rounded upward. For the purpose of awarding points, the team that “wins by forfeit” will receive 3 points for the win and the goal points for the goals deemed scored. All U6 players will receive participation medals after their final game. Teams can use the Awards Area for their presentation if not in use. Players on the 1st and 2nd place teams in each flight will receive medals. The 1st place team will receive the championship trophy/plaque. Uniforms and Player Equipment – All members of the same team must wear jerseys of the same color, except for the goalkeeper who will wear a different color to distinguish them from both teams and the referees. Team shorts should all match and be of the same color. Team socks and any applied tape or covering must also match and be of the same color. Each player on a team (with the exclusion of U6 players) must have a unique number on their jersey that matches the number shown on their official roster as approved during check-in. In the event that both teams show up wearing the same or similar color jersey, it is the responsibility of the home team to change to an alternate color jersey. All players are required to wear shin guards with socks completely covering the shin guards. No player shall wear anything that is dangerous to their self or other players, including but not limited to rings, earrings, watches, necklaces, etc. Protective head gear, casts, and splints may be allowed if adequately padded and wrapped to prevent injury to another player and must be approved by the center referee. Players wearing medical devices are encouraged to check in with the referee staff prior to game time to allow adequate time for alterations. Please refer to FIFA Law IV for questions concerning player equipment. The center referee will have final authority as to what is allowed on the playing field. The Home team (as listed on the schedule) and their spectators shall be seated on the East or North side of the field. The Away team (as listed on the schedule) and their spectators shall be seated on the west or south side of the field. Each team and their respective spectators shall remain on their designated side of the field throughout the match. No persons may stand behind the goal line at any time during a match. Teams shall be seated on the side of the field having technical area markings and player benches (where installed). Coaches are required to remain within their respective technical areas unless invited onto the field of play by the Referee. Only official team coaches/trainers/managers, as listed on the game form, may be in the team’s technical area and provide instruction/assistance to players. Providing coaching instructions from outside of the technical area is not permitted. Spectators shall be seated on the opposite side of the field from the teams and must remain behind the painted standoff line. Oklahoma Soccer Association Rules of Competition will apply to all matches unless otherwise noted. All recreational players must play at least 50% of every game. 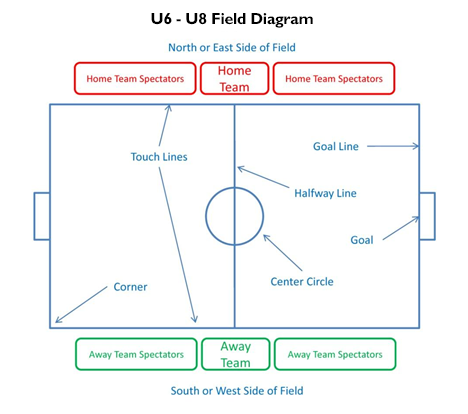 US Youth Soccer guidelines for small-sided games will apply for all small-sided matches. Kickoff – Kickoff will take place at the time shown on the tournament schedule. If a team is not present and ready to play within ten (10) minutes of the scheduled kickoff time, the match may be considered a forfeit. Match Format/Length - All matches will be regulation length as shown below, conditions permitting. The Tournament Director reserves the right to shorten games in the event of inclement weather or other warranted conditions. Overtime period and penalty kick tie breakers will only apply in the semi-final and final games. NOTE: The game clock will not stop except in the case where an injured player must be removed from the field by medical personnel. In the case of extreme hot or humid conditions, water breaks may be designated by the tournament director. The clock will not stop for water breaks. Heading Rule: In 2016 USYS issued a new rule on heading by young players. In an effort to comply with that rule Recreational players on U12 teams and younger shall not be allowed to head the ball. If a player deliberately heads the ball, an indirect free kick will be awarded to the other team at the site of the penalty. U6-U8 - The game shall be divided into four (4) periods of ten (10) minutes each with a break of five minutes between periods. Substitutions shall be unlimited and at the referee’s discretion will be permitted at any stoppage of play. To replace any player for health or injury reasons. For a player who has received a yellow card, at the discretion of the Coach and with permission of the Field Referee. To allow a player who has left the game due to a minor injury to return to the game, as soon as possible, replacing the same player who replaced him/her. 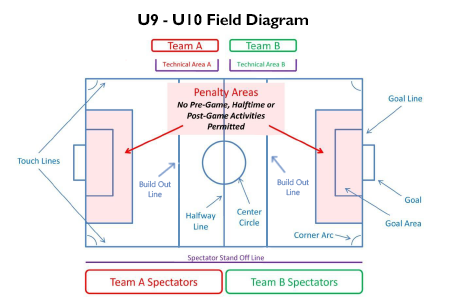 U9-U12 - At the referee’s discretion, substitutions shall be unlimited and be permitted at any stoppage of play. Substitutions at times other than halftime shall be made at the halfway line. Players may only enter the field with the permission of the Referee or Assistant Referee after the substituted player leaves the field. Prior to a throw-in by either team (at referee’s discretion). Following a goal by either team. After an injury by either team, if the injured player is substituted. Conclusion of Match/Reporting - At the conclusion of the match, the Field Referee shall complete the scorecard in detail and submit to the appropriate tournament staff within 30 minutes of completion of the match. The Tournament Committee will maintain an up-to-date list of all red and yellow cards issued during the tournament. A player that receives three (3) yellow cards will be prohibited from playing in the next scheduled game. A red-carded Player or Coach will receive an automatic one-game suspension and the Tournament Director will review continued participation. Field Referees will be notified if a team has an ineligible Player or Coach for their match. All cautions and red cards will be reported to OSA. Where required, red card suspensions not fulfilled during the tournament will carry over to league play. Protests and Appeals - No protests or appeals will be heard unless the rules of the match have been misapplied by the Field Referee and have materially affected the outcome of the game. The protest must be made in writing within 1 hour of the conclusion of the match and be accompanied by a $50.00 bond. The Tournament Director, a Referee Staff, and one Tournament staff member will determine whether or not such action materially affected the outcome of the match. If, in their opinion, the outcome was materially affected, they may take whatever remedial action they deem appropriate and the $50.00 bond will be returned. The decision of the Tournament Director is final and an appeal of the decision will not be allowed. No judgment calls made by the referee may be protested. The Tournament Committee will uphold all suspensions of players and/or coaches, as appropriate. An ejected (red-carded) player or coach who is “Sent Off” is ineligible for their team’s next scheduled match. This includes semi-final and final matches. Any player ejected (red-carded) due to violent conduct will be sent off immediately from game and prohibited from playing the remainder of the tournament. Any player who receives two (2) yellow cards in one match will be treated the same as having received a red card. Any player who receives an accumulation of three (3) yellow cards during the tournament will be treated as having received a red card. Each player or coach who becomes ineligible for his/her team’s next match under the items above will cause his/her team to lose one (1) point in the tournament standings for each red card or equivalent that he/she receives. The team’s coach is responsible for the actions of his or her team staff, players, and spectators. Verbal abuse of referees, players, and/or spectators will not be tolerated and a team’s head coach may be disciplined for such. Such actions may also result in termination and forfeiture of the match and/or expulsion from the tournament. Any coach who has been ejected from the match must remove him or herself out of “sight and sound” from the playing field within two (2) minutes of ejection or risk match forfeiture. Communication from an ejected coach to the team or team staff is not permitted and may result in the match being a forfeit. Any coach, or trainer, who withdraws his or her team from the field during a match, will receive a red card and his or her team will forfeit the match. Field Referees will note all prior ejections of players, coaches, or trainers as furnished by the Tournament Director before the match time and ensure that any such ineligible player or coach does not participate in the match. Field Referees will also notify the Referee Assignor of any yellow or red cards in the match just completed by clearly noting it on the match form turned in at the Referee Headquarters. The Tournament Director will make note of the card(s) issued and the offenses in order that a written report may be made to the player's or coach's respective club, league, or association for further action, if needed. It is the responsibility of the Tournament Director to understand and employ these rules in a manner consistent with fair play and the spirit of the game. For issues not specifically addressed herein, and/or for issues that become subject to interpretation, all decisions made by the Tournament Director are final and binding.